I am puzzled why health spending had such a large impact on first quarter GDP report. I thought the Affordable Care Act impacted the health care expenditures for only a small part of the population. Other people are puzzled, too. The best article that I have found that partially explains the impact of health care spending on first quarter GDP is, “Health Spending and First Quarter GDP: What Happened?“, but it fails to explain why such a small component of the GDP had such a large effect. When I get puzzled with economic data, I go over to FRED and plot some data. So if we follow Tyler Durden’s lead of plotting quarterly changes for health care expenditures and include the Real Gross Domestic Product series we get this graph. You can see that the quarterly change in GDP dwarfs the health care expenditures and it is hard to see much of a correlation between these two indices. Unless we are willing to believe that the tail can wag the dog, we have to conclude that the 2.9% decline in the economy was for economic reasons other than health care expenditures. 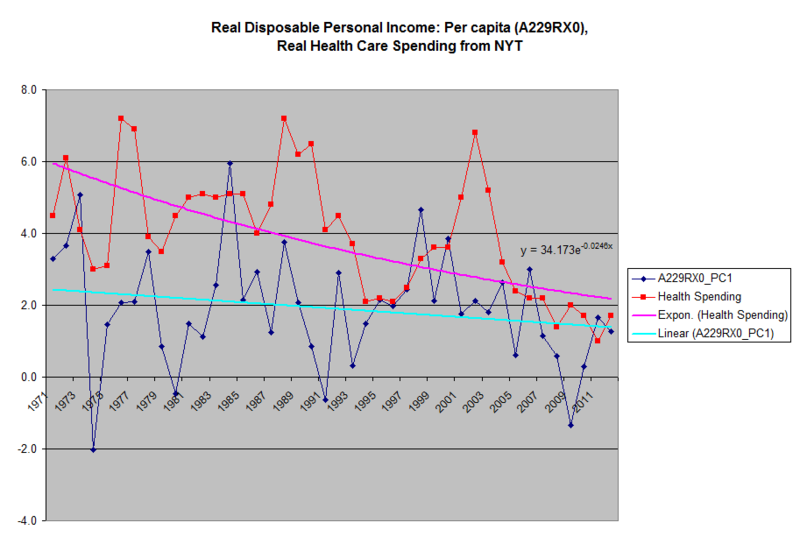 The impact of changes in health care expenditures is still a minor factor in the GDP growth. The Affordable Care Act taxes are probably holding the economy back a little bit but if we want to grow the economy we have to do it the old fashion way by making things bigger, better, faster, or cheaper. The New Deal Democrat aka Hale Stewart from The Bonddad Blog posted this graph on the Business Insider as part of his post, Sorry, Doomers: The Stock Market Isn’t Divorced From Reality and I immediately realized that I had created a similar graph in the Why There is Wealth Inequality post that included a few more lines. So I went back to my old graph , added a line for corporate profits, adjusted it for inflation using the GDP deflator, and got the graph below. Since the Real GDP uses the GDP deflator(GDPDEF) as the inflation adjustment, I adjusted the other lines using the GDP deflator as the inflation adjustment. Maybe its just me but it sure looks like the blue line for corporate profits is following the green line for Federal Debt: Total Public Debt (GFDEBTN) since 2000. When you look at my graph it sure looks like the current profitability is the result of the willingness of the federal government to issue debt. 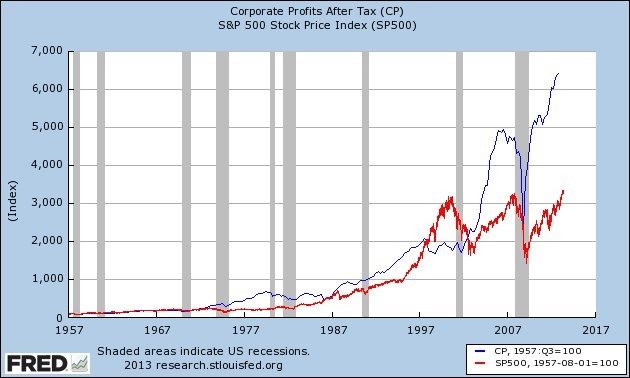 If businesses profits were primarily due to increases in sales then the corporate profits would be following the red line for the S&P 500. In this case it is above both the S&P 500 and the black line for the GDP. If we focus on the last 13 years we can see that corporate profitability trend line is more closely aligned with the debt line. Oops, there goes the narrative that the corporate profits are up because wages just hit an all time low! The corporate profit increase over the last 13 years was debt driven! Since several economists have described this recovery as a balance sheet recovery, it is no surprise that wage growth has been stagnant. Corporate profit increases without wage growth are inevitably fake profits and that explains the lack luster enthusiasm in the S&P 500 stocks. When your accountant is generating more earnings than the guy or gal working down on the floor, you have a troubled business. This is not complicated. 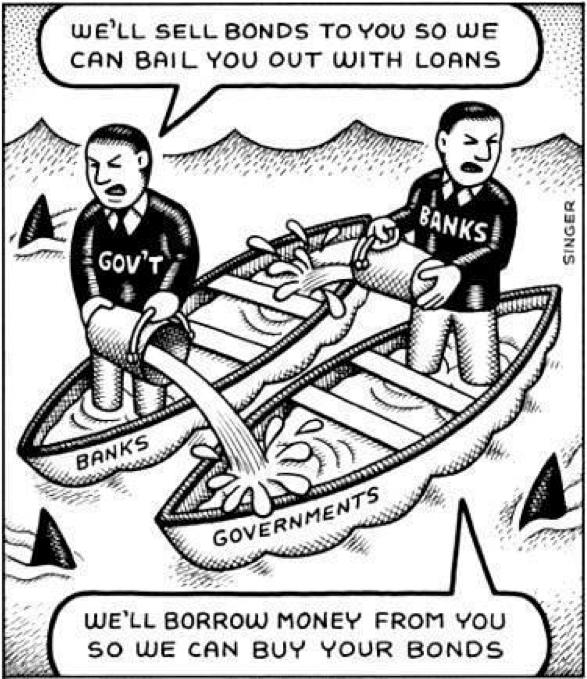 Debt fueled corporate profits were fun but now we have the same tough job ahead of us. If we want higher wages and a growing S&P 500, then we must have real sales growth coupled with productivity increases. This quest is as American as baseball and apple pie. If higher wages and an increasing S&P 500 price is our goal, then our reliance on debt is a distraction and a hindrance. When we fail to create real corporate profits and rising wages it is because we took our eyes off of the ball. A couple days after writing this post I was pondering the question of where did the corporate profits go and why the rising corporate profits were not lifting all ships. Rising corporate profits usually result in high factory utilization rates and labor shortages. This situation typically resolves itself with rising wages, strikes, and sometimes both. Without seeing rising wages in this recovery it seems like the rise in corporate profits was the result of a shell game rather than real economic gain. Then I saw the article written by Jeffrey Tucker on the Daily Reckoning, This Car Won’t Move. The cartoon I included below from his post explains both the corporate profitability and why we have not see rising wages problems quite well. It may be hard to see but if you look closely you will see the wage earners are out there swimming with the sharks.